So it's time to go over some laundry room dimensions that will help you along with your laundry room design and layout. 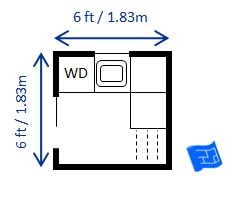 We're going to take a look at laundry appliance dimensions, then I've done up some laundry closet and laundry room layouts for you (including dimensions). We finish off with a word on the door swings on your laundry appliances and the dimensions of the door to your laundry room. This page forms part of the laundry room design series. 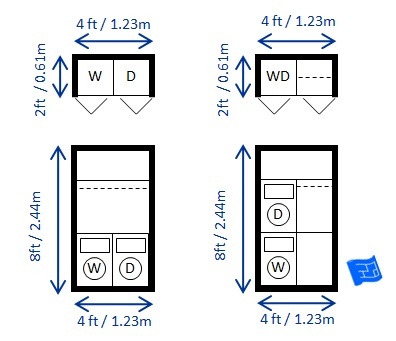 So let's get started with laundry appliance dimensions and how these differ country to country. There must be a story behind why this is. If you know what it is please let me know! Are you ready with your measuring tape? To figure out the space you need to house your appliances, find out the dimensions of your laundry appliances and add a little 'wiggle' room. The wiggle room is important so that your washing machine and tumble dryer can be changed or repaired without too much disruption. 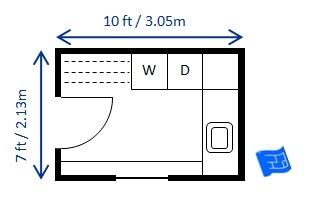 The wiggle room can be mostly in the vertical direction which allows the appliances to be wobbled out forwards and backwards, up and down, rather than side to side. Let's look at a few examples of appliance sizes in the US. These are just examples so make sure you get the measurements for the appliances you're planning to use. So the widths are more or less standardizing around 27". Just when I thought the width was standardized I run into an appliance with a width of 29"! As for height and width, there's quite a bit of variation out there. Here's an idea though. If you have a pedestal under your appliances this, conveniently enough, will raise the top of your appliances to a height suitable for upper cabinets. So you can get a built in look simply by measuring the height of your appliance on a pedestal and installing the upper cabinets to be at a suitable height. A mix of brands from both North America and Europe is available in Australia - pick your appliances and measure! First of all, there are a few explanations to get out of the way. 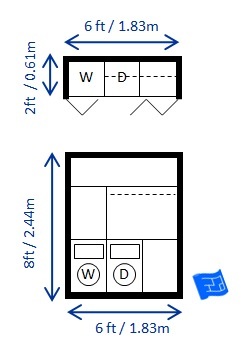 For each layout option there area two versions - one for European appliance sizes, one for US appliance sizes. All appliances are shown as a symbol which includes wiggle room. All dimensions refer to internal dimensions. The dotted lines refer to hanging bars for drying. The distance between runs of units in a laundry should be 48 inches (122cm). You'll also find the how to design a laundry room page useful for deciding on the design of your laundry room. You might also be asking where should I locate my laundry room? First let's start with laundry closets which is really another way of saying laundry room layouts with everything along one wall. So you could use these layouts in a closet or in a transitional laundry room. We'll look at several different widths for both European and North American sized appliances. If you're going to go the laundry closet route think carefully about the depth of your closet. 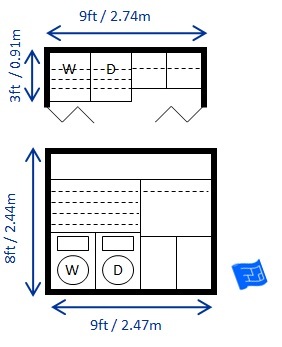 If the plan is to use the back of the doors for storage, the cupboard would need to be made deeper to accommodate the storage on the inside of the door. And yes, you'd only be able to do this if you had swinging rather than the folding doors shown below. 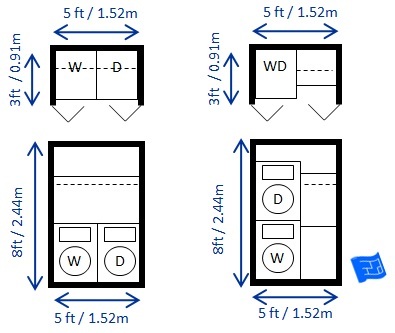 You can see that the appliances in the US / Canada are slightly wider, deeper and higher than a standard 2ft kitchen unit. 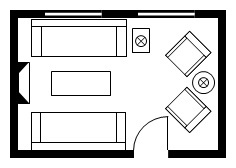 The layout on the right above shows two appliances stacked one on top of the other. 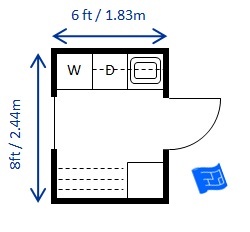 If you want to go for a stacked arrangement with North American sized appliances it may be better to buy a single unit with one unit above the other all sold together. These tend to be smaller. 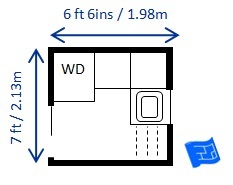 Reaching up to the tumble dryer might be an issue with using two larger appliances. 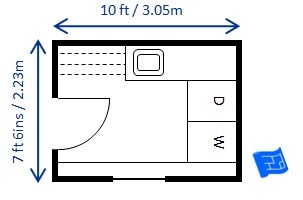 You can see how the laundry appliances in Europe fit in with the standard kitchen unit sizes. 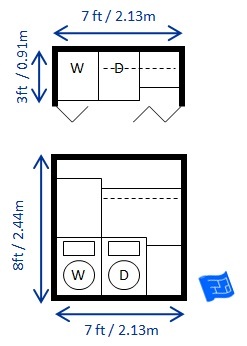 Moving on to 3 unit wide laundry layouts which offer more in the way of storage, drying space and folding space. In the layout above, the cupboard above the washer is a custom size to make it line up with the joint in between the washer and dryer to make it look neater. This could be replaced with a standard kitchen unit if there's no budget for custom work. 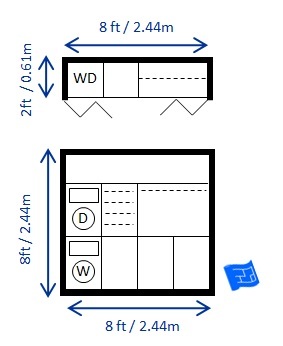 Below is the European version - all cupboards are off the shelf size. Both the North American and European size layouts below feature a drying cupboard (the set of dotted bars). I get a bit annoyed when looking at interior design pictures of laundry room design ideas. You can't get a real sense of how the laundry room will work in real life because most of the time you can't see the whole room. These small laundry rooms are home to a stacked washer and dryer and sink with plenty of space for folding, storage and drying. I think the drying rack would be best built to full height so you can fit at least one load of laundry in there for drying. Ironing in here would be a squash and a squeeze but the ironing board could be stored on a bracket on the wall or maybe inside the drying cupboard. Have a look at the note on door swings below. 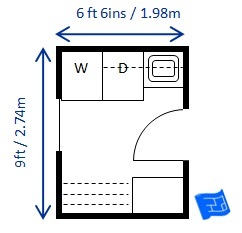 This small room would work best with a pocket door or door opening outwards. These mid size galley laundry rooms have the appliances placed side by side with a sink. There's a large drying rack which could dry multiple loads and plentiful storage and folding space. There would be room to iron in this laundry room. The door to the room could work swinging inwards but that would make it tight to fit an ironing board inside and open and close the door. These large u shaped laundry rooms feature one wall with half depth cabinets. Full depth cabinets on the bottom wall could be accommodated if width of the room is extended by 1ft. There's plenty of room for all the laundry room activities including ironing. Find out whether or not the door swing on your appliances can be changed. Check both the washer and the dryer because for some brands one can be changed, but the other can't. The standard is that the washer door hinges on the left and the dryer door hinges on the right. This allows for laundry to be passed easily from one to the other when they are placed side by side WD. If they're stacked it makes sense to have both the of the doors swing the same way. If your appliances are going to be placed next to a wall, the ideal is for the hinges to be on the wall side so that the door can swing back against the wall. However, make sure the door will open adequately to allow laundry to be placed in and taken out of the appliance easily. It might be a bit of a toss up for which way the door swing works best. For front loaders, find out how high up off the floor the door swing is. That way you can purchase hampers or baskets that will fit underneath the appliances and allow the door to be opened and closed. I guess it's not a big deal to move the basket or hamper in order to open or close the washing machine or dryer, but every little reduction in moving this here and that there makes things flow more smoothly don't you think? Don't make the laundry door too small! Although the laundry is a small room, don't be tempted to make the door too small because you've got to be able to get the laundry appliances in and out of there. 30 inches at a minimum. And you'll need about 45 inches to clear a 90 degree turn comfortably with a large washing machine or tumble dryer.